Ieoh Ming Pei (born Canton, China, 1917 - ), is a Chinese-American architect; Pei is best known as I. M. Pei. He was trained at MIT and Harvard. For ten years he worked with real estate tycoon William Zeckendorf. In 1955, he formed I.M. Pei & Partners. 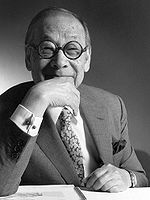 I. M. Pei is the 1983 Pritzker Architecture Prize laureate. Louvre's pyramid by I. M. Pei. National Center for Atmospheric Research, at Boulder, Colorado, 1961 to 1967. Everson Museum of Art, at Syracuse, New York, 1968. L'Enfant Plaza Hotel in Washington, D.C., 1973. Johnson Museum of Art, at Ithaca, New York, 1973. Christian Science Center, at Boston, Massachusetts, 1968 to 1974. Christian Science Complex. Hancock Place, at Boston, Massachusetts, 1977. East Wing, National Gallery, at Washington, D.C., 1974 to 1978. John F. Kennedy Library in Massachusetts, 1979. Javits Convention Center, at New York, New York, 1979 to 1986. Pyramide du Louvre, at Paris, France, 1989. Bank of China, at Hong Kong, 1982 to 1990. Museum of Islamic Art, Doha, 2008. John F Kennedy Library in Boston. Pei Cobb Freed & Partners. Formerly I.M. Pei & Partners. This page was last modified on 2 January 2013, at 21:31.